The school hopes to win a grant for fitness-based playground equipment. 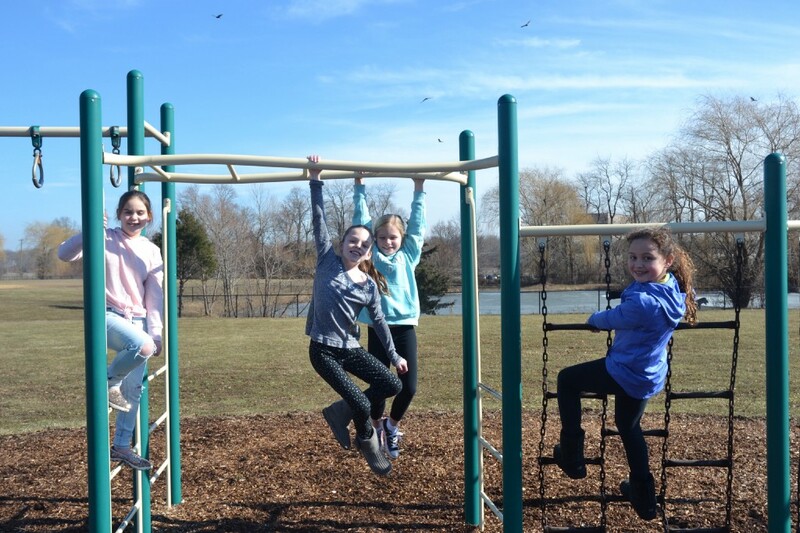 Chairville Elementary School third-grade students Lucia Sherman, Emme Mensching, Sydney Nielsen and Maddie Maurer are pictured on the school’s current playground equipment on Feb. 4. For most elementary school students, recess is the best part of the day. It’s a time they get out of their seats, let loose and release energy that’s been built up throughout the day. For Chairville Elementary School, there could be a new way to unwind and encourage a healthy lifestyle in students: fitness-based playground equipment. The school is in the final phases of a grant contest run through Project Fit America, a nonprofit organization with the goal of instilling fitness in education in elementary and middle schools nationwide. Chairville is competing against 47 schools in the mid-Atlantic region, where four schools will receive a $25,000 grant for equipment, educational resources and training for physical education teachers. The schools with the highest number of online votes will win. Chairville physical education teacher Adam Keagy has been at the school for 12 years, and he, along with principal John Karakashian and nurse Sharon Conway were required to submit essays to Project Fit America to secure a position in the contest. In Keagy’s essay, he expressed his excitement for possibly gaining equipment as a means of infusing new lessons to encourage students to live active lifestyles starting at a young age. Keagy introduces students to various psychical activities throughout the year, such as tag games, team handball, juggling, frisbee golf, parachute games, rock climbing and more. In addition, all students participate in the school’s recess running program, and are able to sign up for intramural sports sessions and the outdoors club (which allows children to engage in hiking, fishing, canoeing, fort-building, etc.). For other students looking to be active in “non-traditional” ways, the school offers a stage construction club for the school’s drama performance. Karakashian praised Keagy’s efforts within the school, especially his devotion toward the Project Fit America grant contest. “He’s a fantastic phys-ed teacher, he takes initiative and he gets things started. I have full confidence in him because he knows how to get the ball rolling — the kids love him and so do the teachers,” Karakashian said. If Chairville is named a winner of the grant, Keagy hopes to continue to inspire students to remain active through various fitness initiatives, such as the use of the equipment to target different muscle groups. Online votes can be submitted through https://schoolgrantswithpurpose.com/#/home/coming-soon or by visiting the Chairville Elementary School home page at https://www.medford.k12.nj.us/chairville. Voting takes place throughout February and votes can be made once per day per email address. The winner will be announced in March, and the equipment would be installed at the school by the start of the next school year.